Sergey Kuzhugetovich Shoygu (Russian: Серге́й Кужуге́тович Шойгу́, Tuvan: Сергей Күжүгет оглу Шойгу; born 21 May 1955) is a Russian politician of Tuvan descent and General of the Army who has served as Minister of Defence of the Russian Federation and as Chairman of the Council of Ministers of Defense of the CIS since 2012. 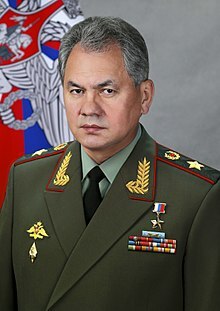 Previously, Shoigu was Minister of Emergency Situations from 1991 to 2012, and briefly served as Governor of Moscow Oblast in 2012. Shoigu holds the military rank of General of the Army. Shoigu is also the President of the International Sport Federation of Firefighters and Rescuers. Shoigu was born on 21 May 1955 in Chadan, Tuva, to a Tuvan father and a Russian mother. He graduated from School No. 1 of Kyzyl city in Tyva Republic. In 1977, Shoigu graduated from the Krasnoyarsk Polytechnic Institute with a degree in civil engineering. Following graduation in 1977, Shoigu worked in the construction projects nationwide for the next decade, advancing from low levels to become an executive. In 1988, Shoigu became a minor functionary in the Abakan branch of the Communist Party of the Soviet Union, and then in Komsomol for a few years. In 1990, Shoigu moved to Moscow from Siberia, and was appointed Deputy Chief of State Architecture and Construction Committee of the Russian Federation. 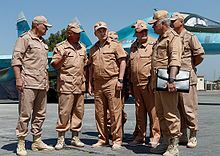 In 1991, he was appointed the head of Rescuer Corps, which was later given more responsibilities and renamed first to the State Committee on Emergencies, and eventually to the Ministry of Emergency Situations, making Shoigu a government minister. He became popular because of his hands-on management style and high visibility during emergency situations, such as floods, earthquakes and acts of terrorism. In 1999 he became one of the leaders of the Russian pro-government party Unity. He was awarded Russia's most prestigious state award – Hero of the Russian Federation – in 1999. In March 2012, he was announced as one of the potential candidates for the Governor of Moscow Oblast. On 5 April 2012, he was elected by Moscow Oblast Duma (legislature) as the 3rd Governor of Moscow Oblast, and took office on 11 May 2012. Shoigu at the Victory Day reception in the Kremlin, May 2017. On 6 November 2012, Shoigu was appointed Minister of Defence when Putin ousted his longtime ally, Anatoliy Serdyukov. According to expert Sergey Smirnov, the so-called "Petersburg group" siloviki of Sergei Ivanov, Sergey Chemezov and Viktor Ivanov wanted one of its associates to take Serdyukov's place at the Defense Ministry. But Putin didn't want to strengthen them, so he took the neutral figure Shoigu. On 7 November 2012, the minister decided to resurrect the tradition of Suvorov and Nakhimov cadets participating in the 9 May parade. In July 2013 Shoigu ordered commanders to begin every morning in the barracks with a rendition of the Russian Anthem, to compile an obligatory military-patriotic book reading list and take the preparation of demob albums under their control. In August that year he ordered to dress all Defense Ministry civilian workers, other staff and management employees in so-called "office suits". Shoigu stated on 26 February 2014 that Russia planned to sign agreements with Vietnam, Cuba, Venezuela, Nicaragua, the Seychelles, Singapore and several other countries either to house permanent military bases and/or to house airplane refuel stations in those countries. In July 2014, Ukraine opened a criminal case against Shoigu; he was accused of helping to form "illegal military groups" in Eastern Ukraine who at the time fought against the Ukrainian army. At the initiative of Shoigu, Arctic units were created, intended to ensure the safety of Russia's Arctic region. On 30 September 2015, Russia conducted a military operation in Syria. The operation was carried out by the created on 1 August 2015 Aerospace Forces, with the support of the Russian Navy. 7 October 2015 President Vladimir Putin, during the took place in Sochi working meeting with Shoigu, summing up the first week of operation, once again gave a high appreciation of the work of the Ministry of Defense: to the Ministry actions in general, and combat operations conducted by the Russian pilots of Syria Air Group, which applied with air strikes against predetermined objectives, and seamen of the Caspian Flotilla, which carried out the firing of cruise missiles 3M-54 Klub from the Caspian Sea and successfully struck all the targets set. Father — Kuzhuget Sereevich Shoigu (1921–2010) (born Shoigu Seree oglu Kuzhuget), editor of the regional newspaper, later worked in the Party and for the Soviet authorities, was the secretary of the Tuva Party Committee and retired with the rank of first deputy chairman of the Council of Ministers of the Tuva ASSR. Also he led the Tuvan State Archives and spent six years as editor of the newspaper Pravda; wrote the novels "Time and People", "Feather black vulture" (2001), "Tannu Tuva: the country of lakes and blue rivers" (2004). Mother — Alexandra Yakovlevna Shoigu (née Kudryavtseva) (1924–2011). Born in the village of Yakovlev in the Oryol Oblast. From there, shortly before the war, her family moved to Kadievka (now Stakhanov) in the Luhansk Oblast, Ukraine. A zootechnician, Honored Worker of Agriculture of the Republic of Tuva, until 1979 - Head of the Planning Department of the Ministry of Agriculture of the Republic, was repeatedly elected deputy of the Supreme Soviet (parliament) of the Tuva ASSR. Sisters — Larisa Kuzhugetovna Shoigu (1953) (deputy of the State Duma) and Irina Zakharova (1960) (psychiatrist). Wife — Irina Alexandrovna Shoigu (née Antipina). She is a President of the business tourism company Expo-EM. Daughters — Yulia (1977) and Ksenia (1991). Sergey Shoigu enjoys studying the history of Russia of Peter the Great's time and 1812–1825 (French invasion of Russia and the Decembrist revolt). Shoigu is fond of sports and is a fan of the CSKA Moscow hockey team. Shoigu also enjoys football and is a fan of Spartak Moscow. In March 2016, together with Sergey Lavrov, Shoigu presented Russia People's soccer league with aims to unite fans of the sport from all over Russia. Shoigu collects Indian, Chinese and Japanese swords and daggers. Shoigu also enjoys bard songs and plays the guitar. He does water color paintings and graphics and is interested in manufacturing handicrafts made of wood. "Medal of Analysis of Encroaching Nato Threat Systems with Steel"
Medal "For Merit of the Stavropol Territory"
Order of "Merit of the Altai Territory"
^ Шойгу Сергей. "Эхо Москвы :: Без дураков: Сергей Шойгу". Эхо Москвы. Retrieved 8 December 2015. ^ "Первой школе Кызыла - 95 лет". Retrieved 25 December 2016. ^ 0divider. "Сергей Шойгу · Биография". Archived from the original on 2 April 2015. Retrieved 8 December 2015. ^ Shoigu Tipped as Next Moscow Region Governor, The Moscow Times. ^ Emergencies Minister shortlisted for Moscow region governance, Russia Today. ^ "Murmansk Governor Out, New Moscow Region Governor In - News". The Moscow Times. Retrieved 8 December 2015. ^ "Putin sacks Defense Minister amid embezzlement probe, replaces with ex-Emergencies Minister Shoigu". RT English. Retrieved 8 December 2015. ^ "Министр обороны Сергей Шойгу на новом посту рискует растерять свой высокий рейтинг". Газета.Ru. Retrieved 8 December 2015. ^ "Ъ-Огонек - Новая летопись военного строительства". Retrieved 8 December 2015. ^ Golts on Shoigu's Tenure (Part II), September 2014, Russian Defense Policy Blog. ^ Sputnik (26 February 2014). "Russia Seeks Several Military Bases Abroad – Defense Minister". Retrieved 8 December 2015. ^ "Ukraine calls businessman and Russian defense minister 'accomplices of terrorists'". WQAD.com. Retrieved 8 December 2015. ^ "Встреча с главой Минобороны Сергеем Шойгу". // Официальный сайт Президента России. 8 October 2015. Retrieved 8 October 2015. ^ "Крылатый "Калибр" против терроризма — ракетные удары кораблей Каспийской флотилии по объектам ИГИЛ". // Официальный сайт «Первого канала». 7 October 2015. Retrieved 7 October 2015. ^ "Зеленодольские корабли нанесли удары по ИГИЛ из Каспийского моря". // БИЗНЕС Online. Деловая электронная газета Республики Татарстан. 7 October 2015. Retrieved 7 October 2015. ^ "Государственный деятель Тувы Кужугет Шойгу похоронен в Москве". Retrieved 25 December 2016. ^ "Мать Сергея Шойгу стала заслуженным работником сельского хозяйства Тувы - ИА REGNUM". Retrieved 25 December 2016. ^ a b "Высокопоставленные родственники. Полпреды - Slon.ru". Retrieved 25 December 2016. ^ "Родня во власти". 24 September 2007. p. 30. Retrieved 25 December 2016 – via Kommersant. ^ "Шойгу Сергей Кужугетович". Retrieved 25 December 2016. ^ "Константин Ремчуков: Герой России Сергей Шойгу". Retrieved 25 December 2016. ^ "Тайна шкатулки губернатора". Retrieved 25 December 2016.